Woody Allen reinvents himself again with the epic historical satire that is a "wonderfully funny and eclectic distillation of the Russian literary soul" (New York Magazine). One of his most visual, philosophical and elaborately conceived films, Love and Death "demonstrates again that [Allen] is an authentic comedy genius" (Cosmopolitan). Cowardly scholar Boris Grushenko (Allen) has the hots for the beautiful Sonja (Diane Keaton), but cold feet for the Napoleonic Wars. Devastated by news of Sonja's plans to wed a foul-smelling herring merchant, Boris enlists in the army -- only to return home a penniless hero! Finally agreeing to marry him, Sonja settles down with poor Boris, to a rich life of philosophy, celibacy and meals…of snow. But when the French troops invade Russia and Sonja hatches a zany scheme to assassinate Napoleon, Boris learns -- in a hilarious but fatal coup attempt -- that God is an underachiever, there are no girls in the afterlife…and that the angel of death can't be trusted! DVD: Widescreen 1.85:1/16x9, standard 1.33:1; audio English Digital Mono, Spanish Digital Mono; subtitles Spanish, French; closed-captioned; double side - single layer; 28 chapters; rated PG; 92 min. ; $19.98; street date 7/5/00. Supplements: Collectible Booklet; Theatrical Trailer. As I noted in my review of 1973's Sleeper, that film ended an era, as it marked the final time Woody Allen would make a consistently light and slapstick comedy. As such, that means 1975's LOve and Death began a new form of filmmaking for Allen. It doesn't quite leap into the semi-autobiographical and introspective territory Allen would mine so successfully over some of his next movies, but it certainly marks a departure from the madcap wackiness of his prior efforts. As such, I regard L&D as Allen's first thoughtful film. To be sure, it contains quite a lot of physical humor, but that style doesn't dominate the proceedings as it previously had. The slapstick also seems less forced to me. In his earlier movies, I felt as though Allen was trying too hard to be someone he's not, and his weak attempts to recreate the physical stylings of the silent era fell flat. L&D, on the other hand, shows Allen appearing more comfortable in his own skin. There's none of the Chaplin-esque posing or goofy wackiness that marred prior pictures; when he goes for physical laughs, they work better just because they seem more appropriately integrated into the project, and also Allen doesn't act like someone else at those times. Although L&D clearly isn't autobiographical, it starts down that street, as I believe it's the first Allen film in which his character appears as a child. That method would be used to great effect in his next movie, 1977's Oscar-winning Annie Hall, and it also works well here. I don't know how this looked in 1975, but now it seems to represent those little baby steps toward his later material. Plotwise, L&D doesn't differ radically from its predecessors. Allen seemed obsessed with anti-dictatorship efforts, as at least three of his movies (L&D, Sleeper and 1971's Bananas) featured them prominently. Actually, that concept was more significant in the first two, as it maintain less importance in L&D. Nonetheless, the story to L&D didn't represent much of a stretch for ALlen. Instead, it was the execution that differed. Gone was much of the gaudy silliness, and in its place we found much more intricate wordplay and semi-cerebral jokes. Even sight gags like the small piece of land owned by the father of Allen's character Boris depend on cleverness in language. This greater emphasis on dialogue actually benefits the physical humor, since it feels much less dominant and forced. Within the context of his other films, many of the slapstick bits would have left me cold, but I liked them here just because they were the exceptions, not the rule. Love and Death doesn't represent Allen at his absolute best, but it's very strong nonetheless, and it clearly marks his first mostly-solid movie. He'd improve on the formula two years later with Annie Hall, but L&D makes for a very entertaining and witty piece. Since it's Allen's first generally satisfying film, it makes sense that Love and Death is also easily the best DVD of his first four movies. (His first four of the MGM releases covered in the boxed set, that is; Take the Money and Run is available from Anchor Bay.) Actually, although I still have two movies to go, it's possible that L&D may be the best of all eight MGM Allens; the DVD features some flaws, but it largely presents a very nice picture. 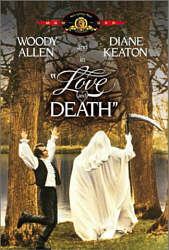 Love and Death appears in both its original theatrical aspect ratio of approximately 1.85:1 and in a fullscreen edition on this double-sided, single-layered DVD; the letterboxed image has been enhanced for 16X9 televisions. Only the widescreen side was rated for this review. Sharpness appeared consistently very strong, with almost no signs of softness. I noticed few examples of moire effects, and artifacts from the anamorphic downconversion on my 4X3 TV also were minor. Print flaws seemed pretty infrequent. I detected some light grain at times, plus a little speckling, a few nicks and some grit appear, but these are not significant issues; for the most part, the movie looks quite clean. L&D doesn't feature a bright palette, but the colors on display all seem nicely rendered. Deep reds seem especially rich and lush, as we see them in some fabrics and settings, but all the hues are accurate and strong. Black levels appeared absolutely terrific, with some wonderfully deep and solid tones, and shadow detail seemed equally good; all low-light situations looked appropriately dense without excessive opacity. All in all, the film presented a very satisfying image. Also relatively good is the monaural soundtrack of Love and Death. Its immediate predecessor, 1973's Sleeper, offered harsh and distorted sound, but this effort cleans up the mix to a considerable degree. Dialogue betrays some slight edginess at times but usually seems surprisingly warm and natural, and I never experienced any concerns related to intelligibility. Effects also showed minor distortion at louder moments, but these were infrquent and they mostly seemed clear and acceptably realistic. The music sounded fairly crisp and bright, although it lacked significant bass. Make no mistake: this remains a 25-year-old monaural soundtrack. Nonetheless, it seems pretty good once I account for the age of the material. As with all the other Allen DVDs, the worst aspect of Love and Death stems from its lack of supplements. Allen doesn't want extras on the DVD releases of his films, so all we find are a theatrical trailer and some brief but very interesting production notes. Despite the plainness of the release, Love and Death seems worthwhile just because it's a pretty good movie. Although I haven't thought much of some of the films, I've enjoyed watching the development of Woody Allen as a filmmaker, and L&D represents his first truly significant step toward the talent he became. It has some weak spots, but overall, it works well. The DVD itself provides a very nice picture plus relatively decent sound, though it contains few extras. Nonetheless, Love and Death definitely deserves a rental, and even moderate Allen fans won't be disappointed if they add it to their permanent collection.